When I got Shannon Sarna’s new book, Modern Jewish Baker, I wanted to run into the kitchen and start baking. It’s that kind of book – based on a few beloved, classic, Jewish bakery basics (challah, bagels, babka and so on) plus an amazing number of inventive variations that sound too seriously compelling to miss. Exactly my kind of cooking. One problem. I have to lose weight and get my glucose at normal levels before my doctor’s appointment next month. OY! Which of these fabulous bakery items should I make and still be on the straight and narrow path until the doctor thing is over? Challah was out because, ok, I had tasted Shannon’s pull-apart spinach-cheese version at the book launch party and had to stop myself from eating more only because it would have been rude and gluttonous not to leave some for the other guests. Rugelach or babka? Tell me the truth -- could you eat just one piece? Me either. I had several samples at that launch party and – see above for thoughts on my ability to control myself if I had this stuff in my kitchen. So it was down to either matzo or pita. I chose pita because matzo means butter. Lots of it, or matzo brei loaded with sour cream, so, no. Pita it was, because then I could have it with the hummus I could make with the recipe from the book and that’s healthy, right? Also, how much pita can one person eat? It's plain old bread, no chocolate or cheese or other extras. Believe it or not, one person can actually eat quite a bit of plain old pita when it’s this good. Plus, it is really a thrill to see those yeasty rounds come out of the oven and actually look like packaged pita! (But taste much fresher and better). I felt like a triumphant teenager who had baked her first cake. Who knew you can make pita at home?! I’ve been at this cooking thing for years and years and never did it before. But I will again! This stuff is not only tasty, but fun to make. And the hummus was quite good too! I’ll start the diet tomorrow. Place chickpeas, tahini, cumin, salt and garlic cloves in a food processor fitted with a blade attachment. Puree for 30 seconds. Add olive oil and process until smooth. Add water one tablespoon at a time until desired smoothness. Spoon onto plate or into a bowl. Top with paprika or za'atar and an extra drizzle of olive oil for serving. Can be kept in an airtight container for 5-7 days in the refrigerator. Passover is less than a month away so I've already begun the purge of pasta and stuff and am also trying to use up all my flour and get ready for the holiday. But there's still snow outside and it's cold here so it's nearly impossible to think spring and all the new beginnings we talk about at the Seder. Even if it is the first official day of spring. That's why, of all the recipes in Naomi Nachman's new cookbook, Perfect for Pesach, I decided to make the Roasted Tomato Soup. Few recipes are more comforting in the winter than tomato soup and yet it is also spring-and-Passover-friendly. This recipe seemed especially intriguing because it calls for both roasted tomatoes and canned tomatoes. It is no ordinary tomato soup. 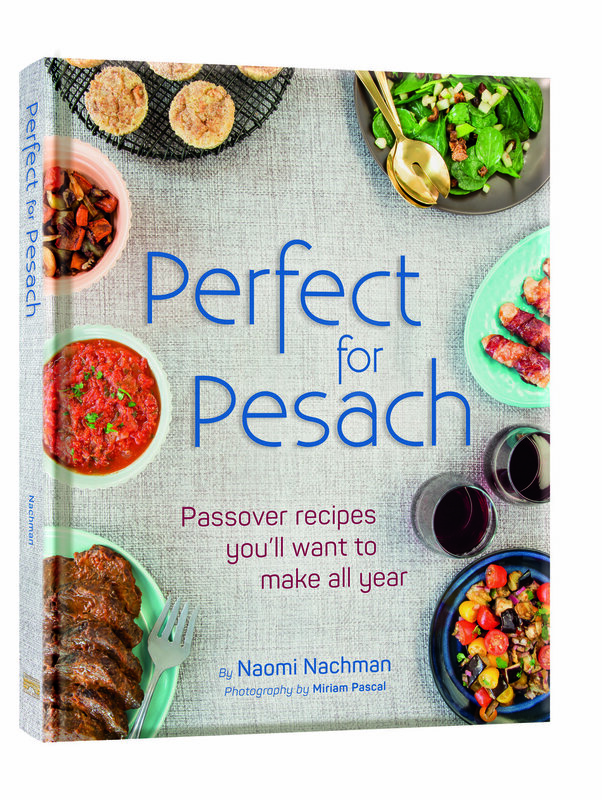 And Naomi's book is no ordinary book, which is chock full of recipes that are not only perfect for Passover, but also year round. Here's another thing that I love about this book: the recipes are EASY, uncomplicated, accessible. There aren't a zillion steps to get to the final product. All the ingredients are easy to find. Almost everyone will have all the equipment needed to make each recipe. The older I get the more I like user-friendly, easy, simple. I don't know how Naomi found the time to write this book. She is a personal kosher chef, she travels world wide, catering all sorts of events. She hosts her own radio show. She gives cooking demonstrations and MCs at scads of events (including Kosher Chopped). She is everywhere and always with a big smile on her face. Kudos to you Naomi! Mazal tov on the book. Growing up, I always loved tomato soup; my mum used to serve it on Sunday night at dinner. Now that I’ve grown up, I make my own version and I discovered that roasting the tomatoes deepens the flavors. Preheat oven to 400°F. Line a baking sheet with parchment paper; set aside. Slice each tomato in half lengthwise; place, skin-side down, on prepared baking sheet. Drizzle with 1 tablespoon olive oil and salt. Roast for 30 minutes or until tomatoes are caramelized; set aside. Heat remaining tablespoon oil in a 4-quart soup pot over medium heat. Add onion and garlic; sauté for a few minutes, until translucent. Add roasted tomatoes; cook, stirring occasionally, for a few minutes. Add crushed tomatoes, stock, and thyme; bring to a boil. Reduce heat to low; simmer for 30 minutes. Use an immersion blender to process soup for a full 3 minutes, until smooth; add salt and pepper to taste. For a dairy meal, add a handful of shredded cheese to each bowl; stir to melt cheese. The older I get, the easier my recipes become. Years ago I was willing to trek through a 3-pager with multiple steps. I made dishes such as French Onion Soup only after preparing my own stock. I was willing to put together a long-winded recipe for Paris-Brest. No longer. I don't have the time, energy or patience -- and will leave those wonderful, worthy chores to younger folks. These days I create recipes that are simple, flavorful and interesting, but without taking shortcuts that would detract from the food. I also appreciate when other people share the same ideals, which is why I love "The Silver Platter Simple Elegance," a new cookbook from the kitchen of Daniella Silver, with tips and notes from Norene Gilletz, renowned food blogger, cookbook author and matriarch of kosher cooking. This is not merely a book where you can pick up a good recipe or two. Every recipe is approachable, using ingredients that even novice cooks will find familiar, with selections that are perfect for everyday cooking and many that are suitable for entertaining: Zucchini Dill Soup and Flaked Quinoa Schnitzel and Mustard-and-Garlic Roasted Potatoes and Granola Ice Cream Cake are just a few, glorious but easy finds that will make your family happy at dinnertime. There's more: at the bottom of each recipe are tips from the master, Norene Gilletz, on such topics as what equipment is best to use, what can be done ahead, what substitutions are appropriate, how to make an everyday dish more company-friendly, and so on. The photos are gorgeous too. Next, the Mango Wild Rice, because I love any dish with mango in it. This recipe is fairly simple, colorful, flavorful and with the bonus that you can cook it ahead. One of Norene's tips is to substitute dried apricots for the dried mango, but I used fresh mango instead. The recipe is versatile too! Taste for yourself: Here are the two recipes I found particularly worthy. The recipes and photos are reproduced from The Silver Platter Simple Elegance by Daniella Silver with Norene Gilletz, with permission from the copyright holders. ArtScroll/Mesorah Publications, LTD.
Another thought -- this book make a delicious Hanukkah gift for someone who likes to cook. Candied cauliflower, drizzled with honey and thyme and topped with sliced almonds, is a beautiful dish that will keep your guests coming back for more. I suggest you double the recipe! 1. Preheat oven to 400°F. Line a rimmed baking sheet with parchment paper. 2. Cut cauliflower into 2-inch florets. Transfer to prepared baking sheet. 4. Bake, uncovered, for 35-40 minutes, or until cauliflower is golden brown and tender. Serve immediately. Variation: Use pecan pieces or coarsely chopped cashews instead of almonds. If you have a nut allergy, substitute pumpkin seeds. Hot Stuff: Don’t worry about the almonds burning. The steam created during cooking prevents that from happening. If your oven is on the hot side, you may prefer to stir in the almonds during the last 15 minutes of baking. My three girls are in love with mango, and this wild rice dish has become their latest obsession. The nutty flavor of wild rice is a perfect match for sweet mango and red onion. The dried mango plumps up a bit when marinated in the dressing, adding some softness to the texture of this dish. 1. Bring water to a boil in a medium saucepan over high heat. Add rice and salt; cover. Reduce heat; simmer for about 45 minutes, or until the grains split and burst. Remove from heat; let stand, covered, for 10 minutes. Drain, if necessary. Transfer to a large bowl; let cool. 2. Add onion, dried mangoes, and cranberries. Stir in oil, orange juice, honey, parsley, salt, and pepper. Toss to combine. Adjust seasonings to taste. Serve chilled or at room temperature. Variation: Since wild rice is fairly expensive, you can use ¾ cup wild rice and ¾ cup whole grain brown rice — their cooking time is about the same. No dried mango? Substitute dried apricots. Wild rice is gluten-free, fiber-packed, and high in protein and B vitamins. Elegance in health! An easy way to cut dried mango is to use kitchen scissors. After Labor Day the entire social structure of my life changes along with everyone else's. All of a sudden we switch gears from grilling and walks on the beach to back-to-school stuff and fall fashions. Everywhere I look now there's a Rosh Hashanah reminder. Even though it's late this year (Jewish holidays are always early or late, never on time). The first night is October 2nd. Not so far away! And so, to paraphrase the poet Shelley, I ask you: when Rosh Hashanah comes can Apple Cake be far behind? No way! Because Apple Cake is one of the culinary icons of the holidays, a rite of passage for all would-be Jewish bakers. It wouldn't be a proper holiday without this dessert. But not every apple cake is quite like Amy Kritzer's! This delectable new version, fragrant with chai-inspired spices (cardamom, cinnamon, ginger and cloves) and cloaked with a soft, maple-infused cream cheese frosting is a standout for its creative take on an old-fashioned classic. It's a beauty as well, with its creamy drizzle and, if you wish, chopped walnuts for garnish. The recipe is from Amy's new book, Sweet Noshings, which is loaded with magnificent recipes that feature modern updates to and new ways with traditional Jewish baked goods. Everything from Mandel Bread (Amy's includes espresso powder and dried cherries), to Chocolate-Lime Sufganiyot (perfect for Hanukkah) to Flourless Chocolate-Orange Cupcakes with Beet (!) Frosting (I can't wait to try that one!). There's even a riff on the classic egg cream (it includes strawberries and almond milk). Anyone who is familiar with Amy's popular blog, WhatJewWannaEat, knows that her recipes always surprise, always inspire. The cookbook does too. Satisfying those of us who like to go beyond ordinary when we cook. And it certainly satisfies a sweet tooth. 1. Preheat oven to 350ºF/ 180ºC. Grease a 12-cup (2.8 L) Bundt pan with butter and a dusting of flour (or use nonstick spray) and set aside. 2. In a large bowl, whisk together flour, baking powder, and salt. Set aside. 3. In a separate large bowl of a stand mixer with a whisk attachment, or in a large bowl with a hand mixer or spoon, mix together oil, eggs, orange juice, and vanilla. Then mix in 2 cups of the sugar until combined. Add dry ingredients to wet ingredients, switching to the beater attachment (or continue to mix by hand). Mix until combined, being careful not to over mix. Batter should be thick but pourable. 4. Peel and core apples and cut into thin, 1/8-inch (3 mm) wedges. 5. Combine apples in a large bowl with remaining 5 tablespoons sugar, cardamom, cinnamon, ginger, and cloves. 6. Spoon a third of the batter in pan. Add half of the apple mixture in an even layer, add another third of the batter. Follow with other half apple mixture and last of the batter. 7. Bake for 1 hour 10 minutes or until toothpick comes out clean. Let cool in the pan for 15 minutes, then remove and finish cooling on a cooling rack. 8. To make drizzle, beat cream cheese and butter with a hand mixer until light and fluffy. Then beat in powdered sugar, butter, maple syrup, salt, and enough milk to get a thick but runny glaze. Keep beating until smooth. Drizzle all over your cooled cake. Although my Mom was the one who taught me how to cook and who encouraged me to expand my recipe repertoire, I post a lot about the dishes my grandma cooked. My mom's food was thoroughly up-to-date and wonderful, but my grandma made the old-fashioned, old-world Ashkenazi favorites that I loved (still love!) so much. And so, when I got hold of Miri Rotkovitz's new cookbook, "Bubbe and Me in the Kitchen," I felt right at home. I understood immediately that for Miri, whose recipes are geared to mostly modern food that today's kosher home cooks prefer, she keeps a special place within her heart and soul for her bubbe, for the foods her bubbe cooked and the words of wisdom, culinary and otherwise, that her bubbe gave to her. Like how bubbe taught her that using spices could "bump up the flavor and stamp a personal signature on favorite dishes." That slicing apples rather than chopping them would result in a more flavorful Apple Cake. The book is filled with some of her bubbe's recipes, culled from a collection of index cards and clippings, plus an occasional recipe from other kosher food writers (including me) and mostly, Miri's own contemporary creations and riffs on traditional dishes. There are so many fabulous recipes, I don't even know where to begin cooking them. Shall it be the chapter on Grains, with the Forbidden Rice Salad with Mango and Ginger Vinaigrette? Or the Mezze/Snack chapter that includes Nori and Smoked Salmon "Petits Fours?" I love meatless meals, so actually, it's the Kasha Varnishkes with Ratatouille for me. This is the kind of dish that brings together traditional and contemporary, that makes a standard side dish into a full meal. This book is a winner and a keeper. Not simply for the wonderful kosher recipes, but also for all the extras: notes on pantry items, information about what kosher means today in terms of global ingredients and healthy eating, and because of the charming narrative and headnotes that lets us hear bubbe's voice, translated by a loving grand daughter. Here's that recipe, so fine for a meatless Monday (but really, anytime). MAKE THE RATATOUILLE: Preheat the oven to 400°F. Warm the oil in a Dutch oven or ovenproof covered chef’s pan set over medium heat. Add the chopped onion and sauté until it softens and begins to turn translucent, about 5 minutes. Add the garlic and sauté 1 minute more. Add the chopped eggplant and cook, stirring frequently, until it begins to soften, about 5 minutes. Add the red peppers, sauté for 2 minutes, then add the zucchini, stirring occasionally, until the zucchini softens, about 3 minutes more. Stir in the tomatoes, tomato paste (or sauce) and thyme. Cover the pan and place in the preheated oven. Bake for 30 minutes, stirring after 15 minutes. The vegetables should be saucy and tender, yet still mostly hold their shape. Remove from the oven, stir in the basil, and season with salt and pepper. Set aside. MAKE THE KASHA VARNISHKES: While the ratatouille is baking, set a large pot of water to boil for the pasta. In a chef’s pan or large skillet, heat 2 tablespoons of oil over medium-high heat. Add the onions and sauté until they turn soft and translucent, about 5 minutes. Reduce the heat and cook, stirring occasionally, until the onions start to caramelize, about 10 minutes more. Remove from the heat and set aside. In the meantime, when the pasta water comes to a boil, stir in the bowties and cook until al dente, about 10 to 11 minutes. Drain and transfer the pasta to a large serving bowl. In a small bowl, beat the egg. Add the kasha and stir well to coat the kasha grains. Transfer the onions from the chef’s pan to the serving bowl with the pasta. Return the pan to the stove top and place over medium heat. Add the kasha and cook, stirring constantly, until the egg dries and the kasha separates into individual grains, about 3 minutes. Add the water or stock to the kasha and bring to a boil. Reduce the heat, cover, and simmer until the liquid is absorbed, about 10 minutes. When the kasha is cooked, add to the bowl with the bowties and onion. Drizzle with 2 table- spoons of oil and stir well to combine. Spoon into shallow bowls and top with the ratatouille. Garnish with additional basil. A colleague of mine, Elizabeth Kurtz, who blogs at GourmetKosherCooking, has written a beautiful cookbook. "Celebrate" celebrates not only good food and the beauty of Shabbat, but also benefits an organization called Emunah, a social service agency that helps families in physical or emotional distress -- at-risk teens, lonely seniors, young children who may have been neglected or abandoned. And much more. The book is filled with interesting recipes. Like the Everything Bagel Chicken, which I made for dinner last weekend. You know that bagel topping that has poppy seeds and sesame seeds and garlic and all? That's a really good coating for boneless chicken breasts! I also loved the Butternut Squash Soup with Curry and Sweet Apples, a comforting dish on cold winter days. There's lots to love here, including the luscious photos. But my cooking mind is turning to Superbowl this week, so I looked for a recipe that I could bring to my brother and sister-in-law's annual party. I picked the Sun-Dried Tomato Dip -- it's easy to make, you can cook it a couple of days ahead, serve it with crudites or crackers. Elizabeth says it's also wonderful as a spread for challah (I liked it with warm pita) and even as a topping for chicken or salmon (I think it would be terrific, mixed with some mayo, on a burger). I made this for my New Year's Eve get-together and everyone gave it a thumbs up! (I used vegetable stock, not pareve chicken broth). Heat reserved sun-dried tomato oil in a large skillet over medium. Add tomatoes, onion, and garlic; cook 5 to 7 minutes, stirring frequently until onion is soft and beginning to brown at the edges. Add water, broth, vinegar, wine, sugar, thyme, salt, and pepper to skillet; bring to a boil over high heat. Reduce to a simmer, cover, and cook 30 minutes. Uncover and continue simmering another 5 to 10 minutes, or until most of the liquid has evaporated and mixture is the consistency of jam. With an immersion blender or food processor, puree until blended but still a little chunky. Serve warm or at room temperature with pita chips or vegetable crudite. Store refrigerated in a clean glass jar (the one from the sun-dried tomatoes works great!) if not using immediately. It will keep 2 weeks. Every year around this time food writers offer up suggestions about what to do with "all that leftover pumpkin" from Hallowe'en. As if we actually use our jack-o-lanterns to make homemade fresh mashed pumpkin. Actually, because I am a food writer, I do cook one small pumpkin but, most of the time I use the canned stuff, like most everyone else. Even so, I am always looking for new recipes for "all that leftover pumpkin" and I found a fabulous one this season: Pumpkin Crumb Cake from Miriam Pascal's new book: Something Sweet. This cake is my kind of dessert. Dense, gently spicy, a sweet top crumb over cake that's not overly sugary. Wonderful with coffee. I believe that when you get a cookbook with even one good recipe it is worth the purchase. And I figured if this recipe was so good, I might find others too. So I made the Flourless Fudge Cookies, which I'll have to remember next Passover because my family gobbled down all 30 cookies rather quickly. The Healthy Summer Fruit Crumbles were another winner. Yes, you can see I am more the coffee cake/granola type. There's a lot in the book for me (yeast dough, Oatmeal Cookie Wedges, Sweet and Spicy Roasted Nuts). But there's plenty in this book for those with a bigger sweet tooth (Chocolate Chip Peanut Pie, for instance, drizzled with chocolate sauce! Or Rice Krispie Treat Truffles!). There are also chapters on beverages, candies, frostings, over and above the usual cakes, cookies, pies and pastries. There are some handy points too. For example, each recipe indicates whether it is dairy or dairy-free (pareve), a nice addition for kosher keepers and those who are lactose-intolerant. And there are suggestions on how to use sugar substitutes for those who do, recipe variations, tips, (including how to plan a recipe ahead), as well as baking guide with info about equipment, ingredients and substitutions. For all those who are looking for a good recipe to use up "all that leftover pumpkin" here's Miriam's recipe. Who can resist a crumb cake? The only thing better than that dense cake on the bottom is the thick layer of cinnamon-y crumbs it’s topped with. I couldn’t resist doing a non-traditional take on this popular dessert, so I came up with this fall-inspired version. It’s full of cinnamon, spice, and, of course, pumpkin. And while I’m not going to claim that this is healthful, the sour cream you’ll usually find in crumb cake has been swapped out for pumpkin, so you’re definitely saving calories there. 1. Preheat oven to 325ºF. Grease and flour a 9x13-inch pan; set aside. 2. Prepare the crumbs: Combine sugars, cinnamon, salt, and flour in a small bowl. Add oil; mix until combined and crumbs form. Set aside. 3. Prepare the batter: In the bowl of an electric mixer, on medium speed, beat together oil and sugars until smooth. 4. Add eggs, pumpkin purée, vanilla, cinnamon, baking powder, baking soda, and salt. Beat until combined. 5. Reduce mixer speed to low. Add flour gradually, beating until justcombined. Do not overmix. 6. Pour batter into prepared pan. Cover entire surface of the cake with prepared crumbs (there will be a very thick layer of crumbs). Note Be sure not to use canned pumpkin pie filling, as it has ingredients not needed here. Of course, homemade pumpkin purée is great, too. Plan Ahead This cake freezes well in an airtight container. For best results, freeze whole and cut into squares just before serving.